Balancing the Feminine and Masculine Through Movement and Chant! 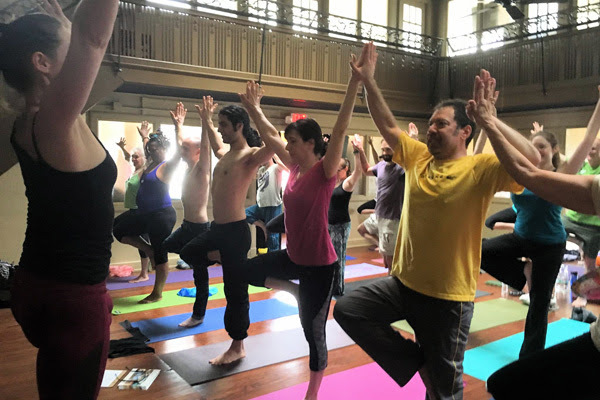 Join Karen Dorfman and Ian Boccio for an extended practice of yoga, chanting and live music! This class will ignite your soul, uniting mantra chants, musical rhythm and a flowing yoga practice to move the energy within you. We are also very happy to be celebrating the re-opening of the Selah Center for events in the yoga and chanting communities! In this workshop we will explore the intricacies of balancing the feminine (Shakti) and masculine (Shiva) polarity in both the physical and energy bodies. Masculine energy flows upwards from the root chakra towards the crown through the pingala nadi on the right side of the spine, while feminine energy flows downwards from the crown chakra towards the root through the ida nadi of the left side of the spine. Bringing these two streams of energy into balance is one of the main functions of yoga in the tantric tradition, which leads to a more complete experience of one's true nature as divine consciousness. The flowing motion of the asana sequences and the vibration of sacred mantra chanted in a group will bring us to a deeper experience of these primal forces within us. Karen leads the group in a variety of flow sequences, restorative poses, rhythmic breathing and energy explorations. Ian plays musical instruments, chants sacred mantras, invocations and songs that complement the yoga poses with healing and expanding vibrations. Students will be taught a few simple mantras to chant during the class.